Sign up for Broadjam today to follow dr jones, and be notified when they upload new stuff or update their news! 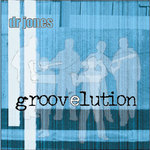 dr jones' 2002 release received superb reviews in national press and boasts a large number of national and international sales. It firmly established the band's reputation for crafting solid funk grooves into memorable, accomplished songs. The band's melodic edge and ear for great hooks and vocal lines is well complemented by some truely awsome instrumental parts and solos.